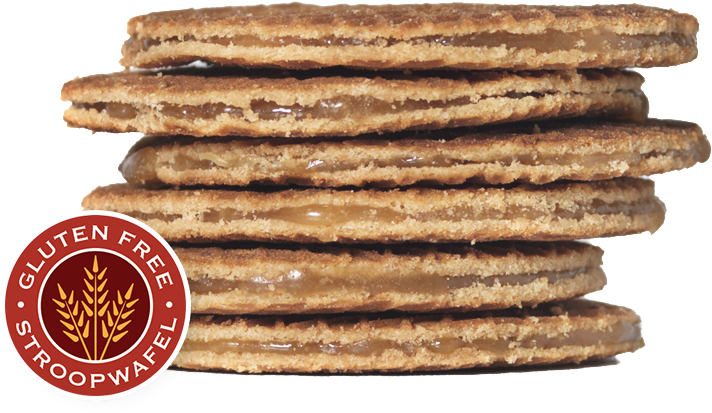 Each Swoffle snack is made from organic, kosher, non GMO, gluten free flour with a layer of creamy caramel in the center and are an ideal compliment to a hot cup of coffee or tea. Not only do we love to share these great products with you, but we also care about making a meaningful contribution in our community. We have teamed up with local non-profits and through purchasing our Swoffles, you're helping to provide meals to those in need. Because of your support, Swoffle is able to provide over 5,000 meals per month to food banks throughout the country. Watch as the gooey caramel center gets warmed by the steam! 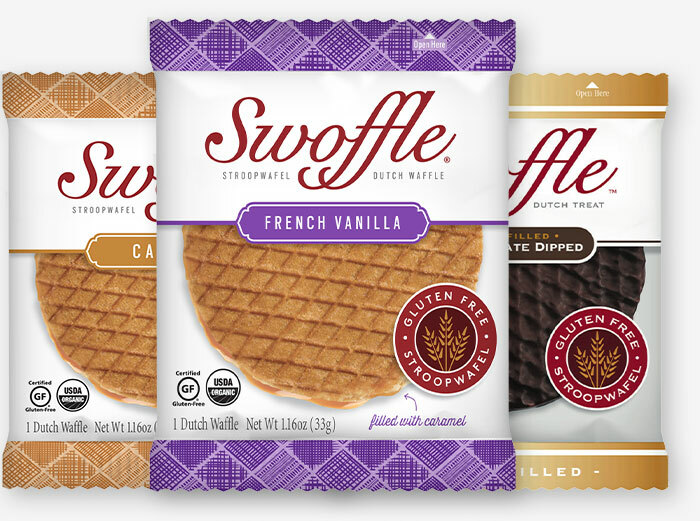 Swoffles are award winning treats that come in three delicious flavors. 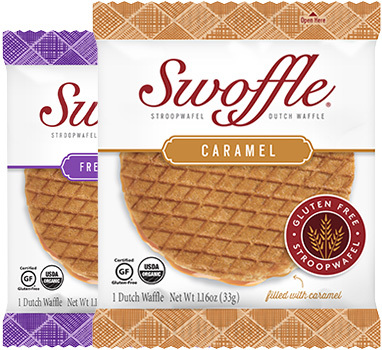 "Swoffle stroopwafels are one of the best gluten free cookies i have ever tasted. Because they are individually wrapped, they make for a great on the go snack, especially if you are going to a coffee shop"
"The best little bit of sweet I have found in a long time! Love the crispy thin crunch with just enough sweetness. Just the right size for purse, lunch box and great for travel! It was so good I was glad I just ordered one or may have over indulged! LOL - Will order again for sure!" "As a frequent visitor to the Netherlands, I can only say that these are every bit as good as the fresh gluten free ones that they make on the street. 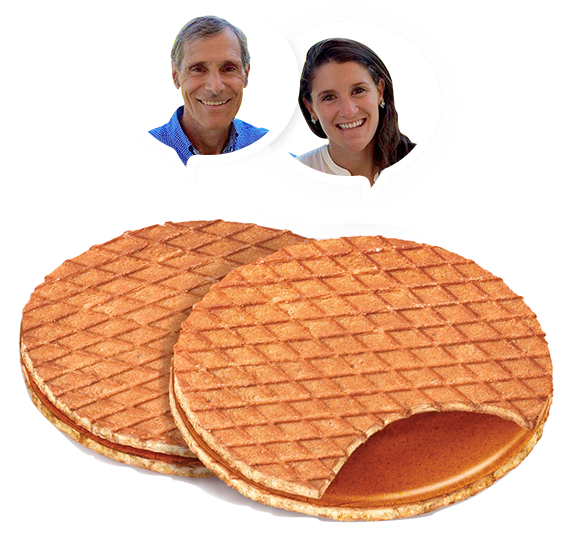 Yes, there are a couple stands that actually make GF stroopwafels!" "The waffles are super moist. They are not chewy or dry. I like their texture. I'd never guess that these are gluten free. The caramel is gooey and sweet. 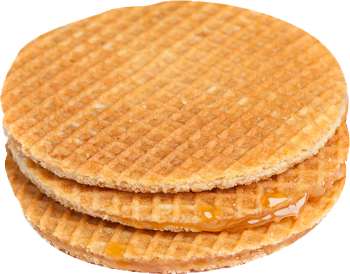 The combination of the waffle and caramel go great together." 20% coupon off your next online order!